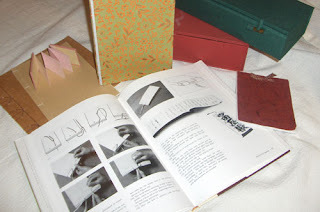 My favorite bookbinding book is Japanese Bookbinding by Ikegami (originally published in 1979). When I first started making books, I got this and read it cover to cover and made everything in it. I had done some 4-hole stab bindings in a class, and the instructor had her copy of this book on hand. I got my copy the next day. It was this book that piqued my interest in the history of bookbinding as it includes historic details about all the bindings described. As well, it is a lot about structure and not so much about creating art...which is the opposite of many new bookbinding books (which are great books, but i do like to start with structure). This is my book spread out here with some of the books and boxes that I've made. If you are thinking you don't need this because you already know how to make a 4-hole stab bound book...I recommend it anyway! It includes the most common stab bindings and the variations but also it includes a lot of box making and portfolio structures, scrolls, ledgers, accordion and flutter books, as well as a multi-section binding with an exposed spine that opens perfectly flat...and the stitches are not visible on the spine; quite an elegant style really. This is an example of one of the ledger styles. Wonderfully simple but a beautiful structure too. I made this one quite large, it is about 9" long and 1" thick as I was trying to replicate the original ledger size. The shape is influenced by Japanese calligraphy of course. "Completed ledgers were often strung together and tied with a long cord so that in case of fire - a common occurance in crowded Japanese towns - they could be flung into a nearby well and later retrieved without damage to either paper or ink." (Japanese Bookbinding, p. 68). I thrive on these little historic tidbits! Agreed, it is one of my favorite books as well. My first books were this book and books, boxes, & portfolios by Franz Zeier. The Zeier book is also great for basic structure vs art books. My collection of books is huge now, but those two are the ones I still pick up the most for reference. Ahh, understanding the structure. Immediately coming to mind is the idea of an architect who does not have the basic understanding of engineering and physics. yes, yes, and yes. i got it for a birthday present one year, and i loff it. i've used it many a time. highly recommended.